6th December is the feast day of Saint Nicholas, the patron saint of children, and also patron of sailors and prisoners. St. Nicholas is a major saint in many European and Eastern countries. It is an old tradition that children leave their shoes out overnight in front of the fireplace, on the windowsill, or outside their bedroom door so that St. Nicholas can fill them with sweets and small gifts and treats. St. Nicholas’ feast day traditions vary widely from country to country, but they all carry the same theme of small gifts and treats left in either shoes or stockings. He lived in the fourth century. 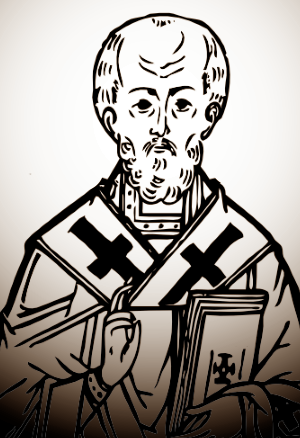 This famous saint was born in Asia Minor, which is modern-day Turkey. After his parents died, he gave all his money to charity. Once a certain poor man was about to abandon his daughters to a life of sin because they did not have the money for a dowry. Nicholas heard about his problem. He went to the man's house at night and tossed a little pouch of gold through a window. This was for the oldest daughter. He did the same thing for the second daughter. The grateful father kept watch to find out who was being so good to them. When St. Nicholas came a third time, the man recognized him. He thanked Nicholas over and over again. According to local Irish legend, Saint Nicholas was buried in the 12th Century in the ruined Church of St Nicholas, Jerpoint. Co. Kilkenny The church is all that remains of the medieval village, Newtown Jerpoint, that fell to ruin by the 17th century. He is also the patron saint of Galway City. It is thought that sailors and merchants, from their travels, brought devotion to him to Galway. On the evening of 5th December, Krampus Night or Krampusnacht, the wicked hairy devil Krampus appears on the streets in many parts of Germany, Austria and Bavaria. 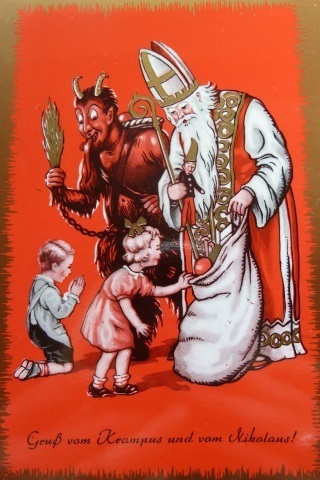 Sometimes accompanying St. Nicholas and sometimes on his own, Krampus visits homes and roams the streets. St Nicholas concerns himself only with the good children, bringing gifts and sweets. Krampus is concerned with the bad children, bringing them coal and a bundle of sticks. Krampus' roots may date back to pre-Germanic paganism in the region. His name comes from the German krampen, which means "claw," and tradition has it that he is the son of the Norse god of the underworld, Hel. I remember being told that Santa brought coal and sticks to bold children so I wonder if there was a folk memory here of Krampus’ deeds. But I never heard of Krampus until about ten years ago when Tom ‘discovered’ him while researching Yule and Christmas and other winter celebrations when he was MC for one of the Tara Celebration's Yule Celebrations. On Krampusnacht processions Krampus and Saint Nick come to life through the use of costumes and wooden masks. The Krampus is the yin to St. Nick's yang. Like all seasonal masked celebrations it seems to acknowledge the good and evil in us all. Being masked gives people an opportunity for ‘divilment’ and to explore and acknowledge ‘the darkside’ of our personalities.